On the front of the dash, you will find an 8.4-inch color, touch screen display that will navigate things like your audio system, rear view camera angles, navigation system, Bluetooth connectivity and much more. You also will enjoy comfortable functions like heated leather seats and an optional heated steering wheel. 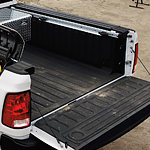 Stop down to Morlan Chrysler today if you are interested in finding out more about the Ram 2500.